SuperCountries is an Ethereum map-based cryptogame where players trade countries with powerful features. The most remarkable one is that anyone who buys at least one country will get Ether dividends for life, even if they sell and leave. Overall, entering the original game offers 6 automated ways to earn Ether. And this is only the beginning: countries will evolve with additional games and gain new mighty features. First additional game, SuperCountries WAR is a worldwide struggle between all previous countries for a big jackpot. 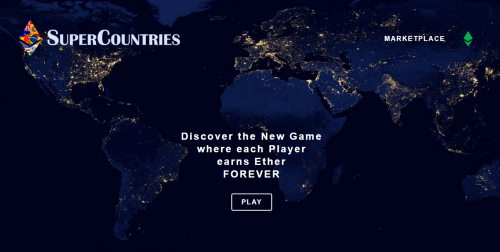 Starting at 7 ETH, the pot can reach 5200+ ETH if only one country remains. For more fun, there is not one but 4 ways to win, 8 riddles to solve and 16 regular contests.